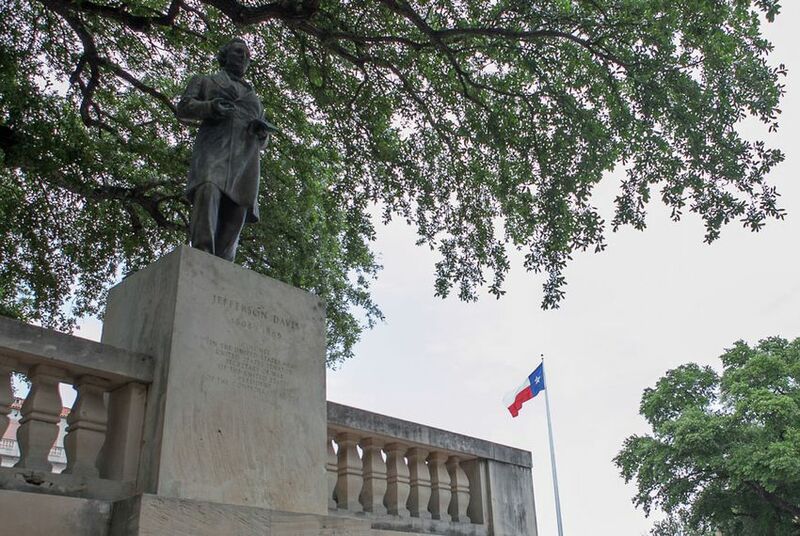 A push to remove a statue of Confederate President Jefferson Davis from the campus of the University of Texas at Austin has gained new momentum after last week's deadly shooting in a black church in South Carolina. School president Greg Fenves will meet with student leaders to discuss the issue Monday afternoon, a university spokesman said. And U.S. Rep. Joaquin Castro, D-San Antonio, joined a group of more than 1,000 students, alumni and UT supporters to sign a petition asking Fenves to remove the tribute on the school's south mall. Fenves, meanwhile, hasn't committed to anything. He said before taking office that he plans to review the issue, but hasn't made up his mind. That hasn't changed this week, said university spokesman Gary Susswein. "President Fenves is taking the issue very seriously," he said. Monday's conversation at UT comes as some South Carolina officials are pressuring state lawmakers to remove a Confederate battle flag from that state's Capitol grounds. The statue at UT has been a source of controversy for years. It was installed on the UT-Austin campus in the 1930s, commissioned by former regent George Littlefield. In recent months, its presence on campus has generated strong pushback. In March, the school's elected student assembly overwhelmingly approved a resolution calling for its removal. And in April the statue was vandalized — someone spray-painted "Davis Must Fall" on its base. "Statues are meant to memorialize and glorify whomever the subject is and project ideals and values," said Rohit Mandalapu, who authored the anti-Davis resolution. Davis' name is synonymous with the Confederacy and slavery, said Mandalapu, who has since been elected vice president of the student body. "Those values aren't in line with the core values of the university and what we hope to project to the world," he said. Recent debate about the Confederate flag across the country has reignited the discussion on campus. A group of student leaders posted an online petition on change.org Sunday night advocating for the statue's removal. It generated almost 1,500 signatures in less than 24 hours. One of those signers was Castro, his office confirmed. In the comments, he wrote: "UT should part with the divisive message represented by the Confederate [statues] featured prominently on campus. It's time to move them to a museum or consider replacing them with a general Civil War memorial plaque to all Americans who died." Others have defended signs of the Confederacy as part of the South's history. "Davis is American history for both sides, and I don't think taking it down would make a difference in that history," said Gary Bray, division commander for the Texas branch of the Sons of Confederate Veterans. "In today's world, it is crazy to take down what everyone in the past put up just because you don't agree with it now." But Mandalapu said he is hopeful that a change may soon come. "President Fenves has been very awesome in wanting to immediately discuss the issue," he said. "They are being extremely accommodating with us."